Ten years into the original version of An Emergency Management Framework for Canada (2007), Federal/Provincial/ Territorial (FPT) Ministers Responsible for Emergency Management are pleased to announce the third edition of this well-established and fundamental text. Reflecting the ever changing emergency management environment and risk landscape, this revised version underscores the linkages between climate change and emergency management, and the need for all areas of society to work together to enhance resilience. In Canada, emergency management adopts an all-hazards approach to address both natural and human-induced hazards and disasters. These are increasing in both number and frequency across the world, resulting in ever growing human suffering and economic cost. Canada is not immune to these events. Natural and human-induced hazards and disasters have become more prevalent in urban and rural communities. Human-induced hazards, such as terrorist attacks and hazard material incidents are likely to persist. In addition, scientists predict that climate change will continue to increase the frequency and intensity of extreme weather events such as heat waves, heavy rainfalls and related flooding, droughts, forest fires, serious winter storms, hurricanes and tornados; that may increasingly strain emergency management capacities and budgets across Canada. These events can have profoundly negative effects on Canadians. Most emergencies in Canada are local in nature and are managed by municipalities and communities, or at the provincial or territorial level. Moreover, accumulating risks associated with factors such as increased urbanization, critical infrastructure dependencies and interdependencies, terrorism, climate change, environmental change, animal and human diseases and the heightened movement of people and goods around the world have increased the potential for various types of catastrophes. Such events could transcend geographic boundaries to challenge FPT emergency management, including response. Each FPT government has a responsibility for emergency management and public safety in Canada. The Framework shall be interpreted in full respect of each government's jurisdiction and nothing in this document shall be construed to derogate from respective governments jurisdiction. Strengthening resilience to natural and human-induced hazards and disasters requires contributions from all-of-society, coordinated by strong and effective leadership from FPT governments. New and evolving technologies present opportunities for FPT governments, Indigenous peoples, municipalities/communities, academia, volunteer and non-governmental organizations, the private sector and individual Canadians to strengthen our collective ability to better prevent/mitigate, prepare for, respond to, and recover from emergencies. The fundamental concepts and principles outlined in the Framework flow from emergency management activities and measures undertaken in Canada. The Framework supports legal and policy frameworks, programs, activities, standards and other measures in order to enable and inspire all emergency management partners and the whole-of-society in Canada to work in better collaboration to keep Canadians safe. Given the dynamic and continuously evolving nature of emergency management across every jurisdiction in Canada, the Framework is subject to revision every five years by FPT governments to ensure that it remains accurate and relevant. The Framework aligns with key international agreements, including the Sendai Framework for Disaster Risk Reduction 2015-2030, which builds on previous agreements, including Hyogo (2005) and Yokohama (1994), to advance disaster risk reduction priorities globally. In addition, the Framework supports implementation of the Paris Agreement, aimed at reducing the impact of climate change, and the United Nations Sustainable Development Goals (SDGs). Each of these agreements aligns with the tenets of this Framework to advance Canada's domestic approach to Disaster Risk Reduction. Recognizing that Emergency management is a shared responsibility across all sectors of society, the Emergency Management Framework for Canada (the Framework) aims to guide and strengthen the way governments and partners assess risks and work together to prevent/mitigate, prepare for, respond to, and recover from the threats and hazards that pose the greatest risk to Canadians. In addition, given that each FPT government has a responsibility for emergency management and public safety in Canada, The Framework aims to strengthen FPT collaboration and ensure more coherent, complementary actions among the FPT governmental initiatives. Prevention and Mitigation – to adapt to, eliminate or reduce the risks of disasters in order to protect lives, property, the environment, and reduce economic disruption. Prevention/mitigation includes structural mitigative measures (e.g. construction of floodways and dykes), non-structural mitigative measures (e.g. building codes, land-use planning, and insurance incentives). Prevention and mitigation may be considered independently or one may include the other. Preparedness – to be ready to respond to a disaster and manage its consequences through measures taken prior to an event, for example emergency response plans, mutual assistance agreements, resource inventories and training, public awareness activities, equipment and exercise programs. Response – to act during or immediately before or after a disaster to manage its consequences through, for example, emergency public communication, search and rescue, emergency medical assistance and evacuation to minimize suffering and losses associated with disasters. Recovery – to repair or restore conditions to an acceptable level through measures taken after a disaster, for example return of evacuees, trauma counseling, reconstruction, economic impact studies and financial assistance. There is a strong relationship between long-term sustainable recovery and prevention and mitigation of future disasters. Recovery programs provide a valuable opportunity to develop and implement measures to strengthen resilience, including by building back better. Recovery efforts should be conducted with a view towards disaster risk reduction. These four interdependent components may be undertaken sequentially or concurrently, but they are not independent of each other. Emergency management in provincial, territorial and federal governments adopts a comprehensive all-hazards approach to coordinate and integrate prevention and mitigation, preparedness, response and recovery functions to maximize the safety of Canadians. Ensuring a strong and seamless relationship across these components and with appropriate emergency management partners, including Indigenous peoples and municipalities/communities, through mechanisms such as mutual aid agreements, is critical to effective emergency management. Effective implementation of the four emergency management components should be informed by evidence-based risk assessment, strong public awareness and community engagement, all of which are key attributes of societal resilience. Neither the emergency management components nor the attributes of societal resilience should be seen as static end-states. Societal resilience requires an emphasis on adaptability and flexibility guided by the principles outlined in the Framework. Traditionally, emergency management in Canada has focused on preparedness and response. It is now recognized that addressing the modern hazardscape requires FPT governments to deal with specific risks, hazards and vulnerabilities through prevention and mitigation as well recovery measures. Greater attention or investment in prevention and mitigation can prevent disasters or significantly reduce the social, economic, cultural, and environmental costs and damages when events occur. Forward looking recovery measures allow communities not only to recover from recent disaster events, but also to build back better in order to help overcome past vulnerabilities. The principles described here are at the heart of the Framework. They reflect the essence of emergency management in Canada and frame the key underlying beliefs and goals of emergency management. These principles are to be considered as a whole to facilitate the attainment of their intended purpose. They aim to support the design, implementation and ongoing improvement of policies, programs, procedures, guidelines and activities that taken together comprise the emergency management systems of Canada. Emergency management roles and activities are carried out in a responsible manner at all levels of society in Canada. Legal and policy frameworks and other arrangements establish guidelines and standards to ensure that due diligence is exercised and accountability is respected in the conduct of emergency management activities. Emergency management responsibilities in Canada are shared by FPT governments and their partners, including Indigenous peoples, municipalities/communities and individual citizens who have a responsibility to be prepared for disasters and contribute to community resiliency. Provincial and territorial governments have responsibility for emergency management within their respective jurisdictions. The federal government exercises leadership at the national and international levels relating to emergency management responsibilities in its exclusive fields of jurisdictions and on lands and properties under federal responsibility. In an emergency, the first response is almost always by the local authorities or at the provincial or territorial level because disasters occur most often locally. Should a provincial or territorial government require resources beyond their capacity to cope in an emergency or disaster, the federal government responds rapidly to any request for assistance by a provincial or territorial government. FPT governments have respectively adopted a comprehensive approach to emergency management. The approach is proactive and integrates risk-based measures, all-hazards, partners from all parts of society and coordinates and balances efforts across the prevention and mitigation, preparedness, response, and recovery functions. All Canadians are involved in emergency management. Individual citizens, communities, municipalities, and federal, provincial, territorial governments, Indigenous peoples, emergency first responders, the private sector, volunteer and non-governmental organizations, academia, as well as international organizations and allies may be involved in emergency management. Whole-of-society partnerships based on effective collaboration, coordination and communication are key components of FPT emergency management systems. Emergency management requires collaboration, coordination and integration to facilitate complementary and coherent action by all partners to ensure the most effective use of emergency management resources and execution of activities. Complementary emergency management systems at all levels are to provide for concerted efforts to facilitate timely and effective prevention and mitigation, preparedness, response and recovery measures to deal with disasters. Coherency of action relies on the existence of clear and appropriate roles, responsibilities, authorities and capacities of emergency management partners and is based on widely shared expectations, understanding and support. A risk-based approach informs the four interdependent components of emergency management in Canada. This approach emphasizes the importance of assessing vulnerability to all hazards in order to determine the optimal balance and integration of measures to address vulnerabilities and risks. The presence of a hazard or a threat that is related to a vulnerability constitutes a risk. Risk management practices that integrate climate change projections facilitate improved decision-making by clarifying the dimensions of risk, including its causes, likelihood of occurrence and possible severity of consequences. Placing greater emphasis on risk reduction measures is a sustainable way to address the trend of rising social- economic costs of disasters that has occurred under approaches focused heavily on preparedness and response. Undertaking prevention/mitigation actions well in advance of hazards and disasters, reduces vulnerability and increases resiliency. This focus is critical because although many hazards cannot be prevented, disasters may be prevented. A systematic assessment of hazards, threats, risks and vulnerabilities relating to people in a geographic area or an organization by appropriate authorities should be carried out before appropriate emergency management measures may be developed. Inadequate management of risks can produce extreme adverse consequences for society, communities, organizations or individuals. Risk-based approaches that are recognized, flexible and effective, allow emergency management activities, programs and systems to be tailored to address particular environments and to accept that living with certain risks may be both prudent and safe. Emergency management adopts an all-hazards approach in every jurisdiction in Canada by addressing vulnerabilities exposed by both natural and human-induced hazards and disasters. The all-hazards approach increases efficiency by recognizing and integrating common emergency management elements across all hazard types, and then supplementing these common elements with hazard specific sub-components to fill gaps only as required. Hazards are sources of potential harm or loss. Emergencies and disasters result when a hazard interacts with a vulnerability to produce serious and adverse consequences that may, for an undetermined period of time, exceed the ability to cope. Natural hazards and disasters that are relevant to emergency management include extreme natural events such as floods, hurricanes, storm surges, tsunamis, avalanches, landslides, tornadoes, wild-land urban-interface forest fires and, earthquakes. Human-induced disasters that concern emergency management include intentional events that encompass part of the spectrum of human conflict, such as terrorist or cyber attacks. They also include electrical power outages or other disruptions to a critical infrastructure sector (e.g. finance, water supply and telecommunications) that result from a human or technological accident or failure. In addition, biological hazards, for example animal or human health diseases that risk causing a pandemic, concern emergency management in Canada. Each hazard should be identified and assessed by appropriate authorities in order to prioritize hazards against potential vulnerabilities in society. By assessing the risks associated with all hazards in an integrated way, efforts may be broadly effective in reducing the vulnerability of people, property, the environment and the economy. Resilience is the capacity of a system, community or society to adapt to disturbances resulting from hazards by persevering, recuperating or changing to reach and maintain an acceptable level of functioning. Resilient capacity is built through a process of empowering citizens, responders, organizations, communities, governments, systems and society to share the responsibility to keep hazards from becoming disasters. Resilience minimizes vulnerability; dependence and susceptibility by creating or strengthening social and physical capacity in the human and built- environment to cope with, adapt to, respond to, and recover and learn from disasters. FPT governments aim to be as open as possible regarding the work each does in emergency management. Clear communications by appropriate authorities are a critical and continuous process before, during and after an emergency. Prior to an emergency, communication objectives focus on public education concerning emergency management to enhance awareness of hazards, risks and vulnerabilities; strengthen prevention, mitigation and preparedness measures; and provide information on all aspects of emergency management. Effective monitoring and reporting can help identify potential threats before they escalate into disasters. Public alerting communicates warning messages that a disaster is imminent and provides the public with recommended actions to manage an emergency. Communications during and directly after a disaster explain and guide immediate response actions to minimize impacts and to maintain safety and security. These communications are instructive on the requirements for short, medium and long-term recovery. Lessons learned and knowledge generated from quantitative and qualitative information should be used to develop improved practices, which are then shared widely. After emergencies or disasters occur, a systematic approach is used to learn lessons from the experience, increase effectiveness and improve emergency management practices and processes. Recovery from a disaster may be completed by documenting and internalizing lessons learned. Continuous improvement, including incremental and transformational change, is undertaken systemically as an integral part of emergency management measures and practices at all levels, as appropriate, to minimize the recurrence of problems. There is no role more fundamental for FPT governments than preserving the safety and security of their citizens. Emergency management decisions made by FPT governments are guided by ethics and values that accept the primacy of human life and human dignity. When actions may save lives, preserve the environment or protect property and the economy, the immense impacts of these decisions must be weighed carefully within the context of emergency management ethics and values. Whole-of-society partnerships based on effective collaboration, coordination and communication are key components of FPT emergency management systems. FPT governments operate cooperatively within the jointly established FPT emergency management governance structure, which facilitates coordination and collaboration in full respect of each government's legislated jurisdiction. Distilled to its most fundamental structure, the diagram in Figure 1 provides a summary overview of the FPT emergency management governance structure. It is based on three governing tiers and a variety of FPT co-chaired working groups that support agreed upon decisions and strategic directions. The diagram represents rectangular boxes in 4 tiers of the federal/provincial/territorial (FPT) emergency management governance structure. The top tier is comprised of one red rectangular shape with white text that reads “FPT Ministers” written inside. The second tier contains a red rectangle shape that is linked to the top tier by a line, and contains the white text that reads “FPT Deputy Ministers” in a rectangular box. The third tier from the top is linked to the second tier by a line and has white text inside a red rectangle that reads: SOREM ( Senior Officials Responsible for Emergency Management). An additional red rectangular shape is linked to the right side of the SOREM box with a dotted line with white text that reads “Canada's Platform for Disaster Risk Reduction Advisory Committee”. The fourth tier is comprised of 5 red rectangular shapes that are linked to the third tier by lines and contains the following white text; Prevention / Mitigation Working Group, Preparedness Working Group, Response Working Group, Recovery Working Group, Other Working Groups as Required. 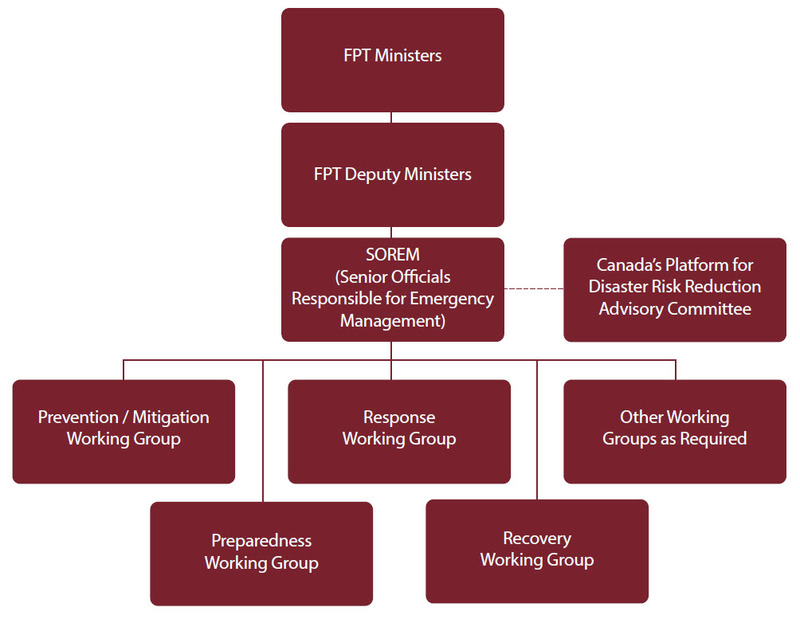 FPT Ministers occupy the top tier in the FPT emergency management governance structure. FPT Deputy Ministers are the second tier of the structure, and are responsible for implementing ministerial decisions by setting priorities and assigning FPT Senior Officials Responsible for Emergency Management to take responsibility for action items. Working Groups report to the FPT Senior Officials Responsible for Emergency Management, submitting proposals and reporting on the results of their ongoing work. There is no reporting relationship between the FPT Senior Officials Responsible for Emergency Management and Canada's Platform for Disaster Risk Reduction Advisory Committee; however, the two groups work closely together to advance Disaster Risk Reduction and emergency management priorities. The composition of the Working Groups is based on the multi-sectoral nature of emergency management and may require the participation of FPT government partners from different departments. There are four standing Working Groups that are organized according to the four components of emergency management. There are additional horizontal Working Groups, and sub-working groups that also report to Senior Officials Responsible for Emergency Management, which are created and operate as required. The Ministerial tier of the governance structure oversees the Deputy Ministers' tier, which in turn oversees the Senior Officials Responsible for Emergency Management. The Senior Officials Responsible for Emergency Management in turn oversees the various Working Groups and then report up the governance structure on progress. Regular meetings and teleconferences support the ongoing operations of the entire FPT governance structure. Working Groups hold meetings and teleconferences as required based on workload and timelines, while respecting the schedule of other tiers of the FPT emergency management governance structure. The FPT emergency management governance structure, its Working Groups and the guidelines set out in the Framework has led, among other things, to the creation of FPT emergency management strategies and concordant action plans for their implementation. National strategies and mechanisms stem from, and are created to support and enable the Framework, which are employed to help FPT governments advance their emergency management activities. In their most effective form, these tools work together to create a coherent and complementary FPT government approach to emergency management in Canada. Relevant policy and guidance documents, such as the National Strategy for Critical Infrastructure and Action Plan, and the National Emergency Response System, enable effective FPT emergency management coordination at the national level. Given the continuously evolving emergency management environment, and the recognition that the lifespan of coordination instruments is directly related to their relevancy within this continuously evolving environment, an evergreen compendium document has been developed that lists the FPT coordination instruments. The field of emergency management continues to evolve and FPT governments have contributed to this evolution through evidence-based legislation, policies, programs, activities, standards and other measures grounded in the emergency management principles. The hazardscape is increasingly complex and dynamic. Canada benefits from a collaborative, comprehensive emergency management system, which must continue to adapt to changes in the hazardscape and build a more resilient Canada. Looking ahead, it is important to acknowledge both the foreseeable and unforeseeable issues that may shape future vulnerability, hazards and disasters in Canada. Factors such as climate change, environmental change, demographic transition, urbanization, and interdependency of critical infrastructure require continued commitment to comprehensive and integrated emergency management. Efficiency and effectiveness are built through common, consistent approaches to emergency management. Ongoing coordination and cooperation must continue to be fostered. By encouraging all segments of society, including individuals, communities, private and public sectors, volunteer and non-governmental organizations, and academia to take responsibility and participate in emergency management, whole-of-society resilience can be achieved. An Emergency Management Framework for Canada is established through FPT governments' emergency management systems. 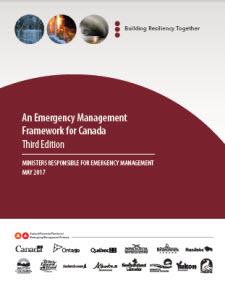 This cornerstone document guides a cohesive approach to emergency management across Canada and helps foster a broad understanding of emergency management principles. As FPT governments continue to strive to become safer and more resilient, this Framework should be leveraged to foster a shared understanding of emergency management in all sectors of society. This glossary is provided for reference purposes and is not intended to modify existing definitions in various federal, provincial and territorial laws in effect. Emergency management adopts an all-hazards approach in every jurisdiction in Canada by addressing vulnerabilities exposed by both natural and human-induced hazards and disasters. The all-hazards approach increases efficiency by recognizing and integrating common emergency management elements across all hazard types, and then supplementing these common elements with hazard specific sub-components to fill gaps only as required. As such, “All-Hazards” does not literally mean preparing to address any and all potential hazards in existence. Rather, it emphasizes the leveraging of synergies common across hazards and maintaining a streamlined and robust emergency management system. The “All-Hazards” approach also improves the ability of emergency management activities to address unknown hazards or risks. Refers to a change of climate which is attributed directly or indirectly to human activity that alters the composition of the global atmosphere and which is in addition to natural climate variability observed over comparable time periods. Refers to processes, systems, facilities, technologies, networks, assets and services essential to the health, safety, security or economic well-being of Canadians and the effective functioning of government. Critical infrastructure can be stand-alone or interconnected and interdependent within and across provinces, territories and national borders. Disruptions of critical infrastructure could result in catastrophic loss of life, adverse economic effects, and significant harm to public confidence. Essentially a social phenomenon that results when a hazard intersects with a vulnerable community in a way that exceeds or overwhelms the community's ability to cope and may cause serious harm to the safety, health, welfare, property or environment of people; may be triggered by a naturally occurring phenomenon which has its origins within the geophysical or biological environment or by human action or error, whether malicious or unintentional, including technological failures, accidents and terrorist acts. The concept and practice of reducing disaster risks through systematic efforts to analyze and manage the causal factors of disasters, including through the mitigation and prevention of exposure to hazards, decreasing vulnerability of individuals and society, strategic management of land and the environment, improved preparedness for disaster risks, coordinated response and planning and forward looking recovery measures. A present or imminent event that requires prompt coordination of actions concerning persons or property to protect the health, safety or welfare of people, or to limit damage to property or the environment. A disaster risk reduction concept that includes consideration for both the hazard of global climate change, as well as community vulnerabilities and resilient capacities. Unsustainable alterations to the physical environment and human interactions with it, may create or exacerbate risks that exist with or without climate change. As such, sustainable adaptation must be considered both within context of climate change and the broader hazardscape. The cumulative emergency management environment, composed of all hazards, risks, vulnerabilities and capacities present in a given area. A pre-arranged agreement developed between two or more entities to render assistance to the parties of the agreement. Any individual, group, or organization that might be affected by, or perceive itself to be affected by an emergency. Actions taken to avoid the occurrence of negative consequences associated with a given threat. Actions taken to eliminate or reduce the impact of disasters in order to protect lives, property, the environment, and reduce economic disruption. Prevention/mitigation includes structural mitigative measures (e.g. construction of floodways and dykes) and non-structural mitigative measures (e.g. building codes, land-use planning, and insurance incentives). Prevention and mitigation may be considered independently or one may include the other. Resilience is the capacity of a system, community or society exposed to hazards to adapt to disturbances resulting from hazards by persevering, recuperating or changing to reach and maintain an acceptable level of functioning. Resilient capacity is built through a process of empowering citizens, responders, organizations, communities, governments, systems and society to share the responsibility to keep hazards from becoming disasters. The combination of the likelihood and the consequence of a specified hazard being realized; refers to the vulnerability, proximity or exposure to hazards, which affects the likelihood of adverse impact. The concept that sound emergency management decision-making will be based on an understanding and evaluation of hazards, risks and vulnerabilities. The use of policies, practices and resources to analyze, assess and control risks to health, safety, environment and the economy. A sustainable approach is one that meets the needs of the present without compromising the ability of future generations to meet their own needs. The presence of a hazard and an exposure pathway; threats may be natural or human-induced, either accidental or intentional. The conditions determined by physical, social, economic and environmental factors or processes, which increase the susceptibility of a community to the impact of hazards. It is a measure of how well prepared and equipped a community is to minimize the impact of or cope with hazards.